Background: Many plant extracts show a synergistic effect with each other or with modern drugs, the drugs from natural sources contain steroids, flavonoids, glycosides and terpenoid that have clinical importance for analgesic, anti-inflammatory and antipyretic action. Objective: The study was designed to evaluate the effective polyphyto admixture TLB for the analgesic, anti-inflammatory and antipyretic action using different animal model. Material Methods: The test drug TLB was composed of Polyphyto formulation of Tridax procumbens, Lawsonia inermis and Bouganvillea spectabilis in four different proportions [TLB-I (1:1:1), TLB-II (1:1:2), TLB-III (2:1:1), and TLB-IV (1:2:1)]; tested for the analgesic activity by Hot plate and Tail immersion method, antiinflamatory activity was studied by using plethysmometer and antipyretic activity was studied by using rectal thermometer at a dose of 100 mg/kg po. Results: The result of test drug TLB produced statistically significant effect (<0.05) when it was studied in Hot plate and Tail immersion method, the inhibition of edema induced by carrageenan and reduced fever induced by Brewer’s yeast at 100 mg/kg po administration when compared to the control groups. 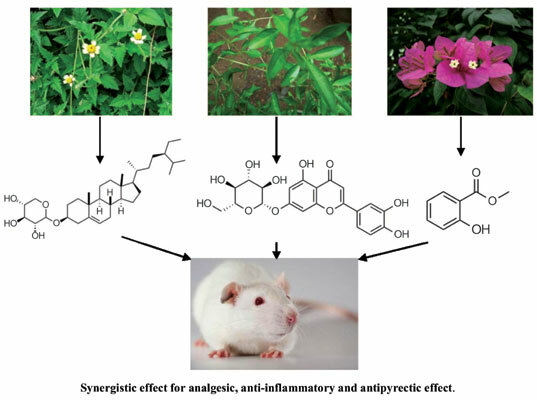 Conclusion: Direct crude drug combination of test group TLB containing Tridax procumbens, Lawsonia inermis and Bougainvillea spectabilis possesses significant analgesic, antiinflammatory and antipyretic activity. Tridax procumbens, Lawsonia inermis, Bouganvillea spectabilis, analgesic, anti inflammatory, anti-pyretic activities.